Educator Marianne Miguel teaches voice and chorale music to young children and teenagers at St. Scholastica's College and St. Paul College. Last year, she enrolled in Philippine Educational Theater Association (PETA) Workshop Weekends' Creative Musical Theater class. Miguel came from a family of musicians. She is the granddaughter of world-renowned Filipino violinist Carmensita Lozada who reaped awards here and abroad. Before she attended the workshops she has acquired on-stage skills, joining school theater clubs and performing in Pilipinas Circa 1907 of Tanghalang Pilipino. PETA's workshop came to Miguel like a blessing. After laying low because of a jaw dysfunction, Miguel enrolled in the workshop. "After so many years of suppressing my passion, PETA came to me," she said. "And I told myself, I must give time for this." Miguel attended each session of her Creative Musical Theater class with a renewed enthusiasm for her craft. In the two-month module, she participated in sessions on voice, composition, performance, and various music explorations. Rigorous rehearsals and acting exercises brought rewarding results. The workshop culminated in a final showcase, where participants perform in front of an audience on the PETA stage. 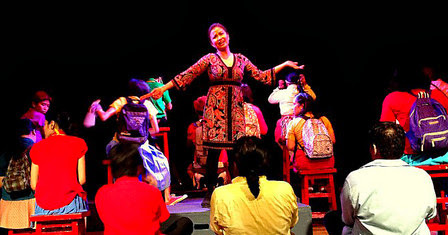 During the 2012 Workshop Weekends, the participants staged an original piece which told the story of Madam X. Madam X is an authoritarian teacher whose irrational classroom rules drove her students to their limits, causing them to turn against her. "In this production, I stepped out of my comfort zone," she said. It is also with the Workshop Weekends that Miguel realized that the purpose of singing and making music is about telling a story to an audience rather than just plainly belting out a tune. "In PETA I felt the purpose of why I sing. I came to realize that it is not about producing amazing music but taking your audience in a journey and fully understanding the text and using your entire body." With director Phil Noble and composer Jeff Hernandez as her teachers, Miguel found new and creative approaches to teach her students. "As a choir teacher handling shy beginners, I was able to share my experience with my students and apply what I have learned in our modules. The workshop also introduced me to innovative ways to engage my students," Miguel shares. Aside from her new acquired skills as a teacher and performer, Miguel is convinced that her workshop with PETA was a holistic experience that she will never forget. "With PETA, the artist-teachers will focus on your core personality as an actor, as a performer, and as a human being," Miguel said. The Workshop Weekends is a nine-week theater course for young adults and professionals from October 12 to December 1. Apart from Creative Musical Theater, PETA also offers Theater Arts and Basic Acting for ages 17 and up. Each course incorporates the Integrated Theater Arts Approach which combines five different disciplines in theater such as creative drama, body movement and dance, creative sound and music, creative writing, and visual arts. A final showcase on the PETA stage concludes the entire workshop experience.